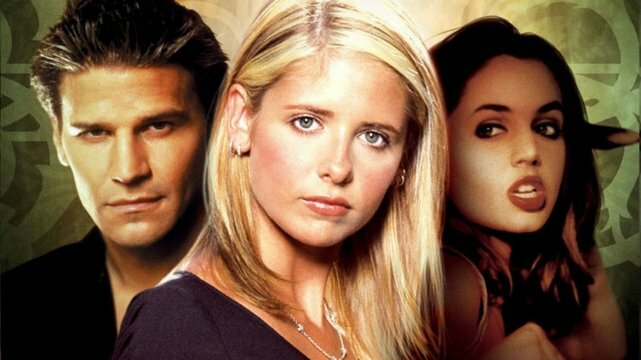 When it was announced that Joss Whedon was working on a reboot of his own masterpiece Buffy the Vampire Slayer, it was met with a lot of mixed feelings by those fans that hold the late-90s show up in the highest regard. Even the promise that the new series would modernize things and cast an African-American actress in the lead role as the Slayer didn’t do enough to convince people that a relaunch of the classic show was necessary. Someone who is excited for it, though, is David Boreanaz – who made his name playing Buffy’s undead boyfriend Angel on both the original series and his own spinoff show. The actor was speaking at a panel at New York Comic Con this weekend when the topic of the reboot came up. As the mention of it was met with boos from the audience, Boreanaz spoke up in its defense and said he wished Whedon’s new version all the best. Of course, Boreanaz isn’t only former Buffy star to react positively to the reboot. In fact, he’s not even the first vampire on the show to do so. James Marsters – who played Spike, Angel’s rival for Buffy’s affections – has previously heaped praise on it as well, saying that he’d love to reprise his role on the series. This isn’t actually as unlikely as you might think, either, as an open letter to the fans, released in response to the backlash, from new showrunner Monica Owusu-Green suggested that the relaunched Buffy wouldn’t be a reboot in the sense that it’d remake the original but more that it’ll be a fresh interpretation that built on the original mythology – which leaves it open for any other cast members to return. We’ll keep you posted as more updates on the Buffy the Vampire Slayer reboot come in, but in the meantime, feel free to share your thoughts on the project in the usual place below.